Barnes attracted a number of fans over the years, through his time on films like The Chronicles of Narnia, Dorian Gray and The Big Wedding, and even the HISTORY channel miniseries Sons of Liberty. When I first met Barnes, he told a story about how a girl he met at a screening event who was by far the most memorable. While he described her as "very lovely" and "gentle and normal," he said he found a photo she posted during a recent Facebook chat. 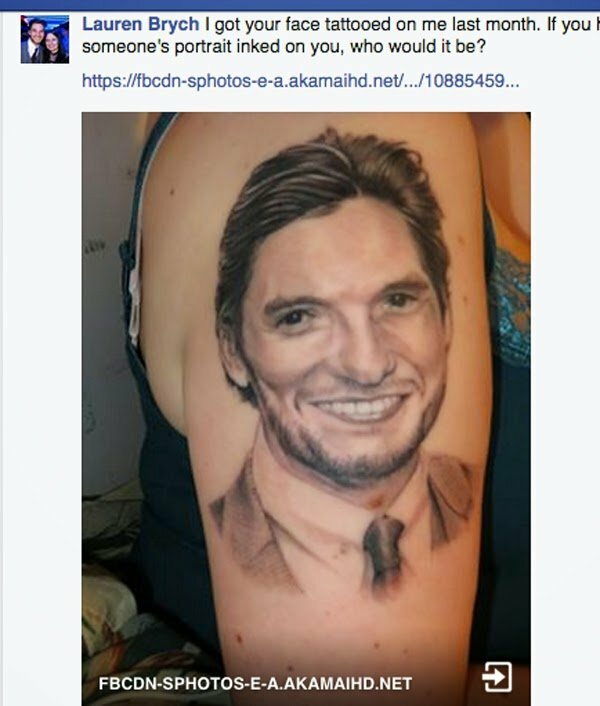 One girl posted a picture of a tattoo she had just got done of my face on her arm. Barnes didn’t answer the question, as he was taken aback. He responded with, "Is that true?!?!!!" before posting a cartoon of a panda pounding its head against an "OMG" sign. We’re not quite sure what he meant by that, but it seems like an appropriate reaction. Elsewhere, he said he encountered some highly critical fans of Seventh Son, even when the trailer was the only piece of released content. Some people, he notes, will review a film based on a trailer, which he calls insane. Both fans and haters will finally get to see Seventh Son in theaters on Feb. 6. Directed by Sergei Bodrov and co-starring Jeff Bridges and Julianne Moore, it was originally supposed to hit theaters in 2014, but kept getting pushed back into 2015. The cast shot the film all the way back in 2013, and some of the cast, including Bridges and Barnes, even came out to San Diego Comic-Con that year to promote the film and show off some footage. However, the extended delay, critical reviews and a dwindling promotion campaign have experts projecting only a $7-$10 million opening weekend. That’s not a good thing, considering Seventh Son was made on a $95 million budget with extra expenses used to promote it.